Indian Wedding Photography captures the wide array of traditions and rituals that are tied to the celebrations. Indian weddings can turn into a week long festival that honors not only the bride and groom, but their families as well. These weddings are marked by lavish decorations, extravagant gifts, and hundreds of people in attendance. The bride and groom may not even know most of the guest at their wedding, but every single person participates in the jubilation. All attendees end up on the dance floor, from toddlers to great-grandparents. One ritual that is often seen in Indian Wedding Photography is money strewn about the dance floor. This occurs when the bride and groom dance together, surrounded by their many guests. As the couple dances, it is custom for family and friends to throw money at the newlyweds to wish them prosperity. This picture shows the aftermath of this tradition, with cash thrown about the tiled floor. 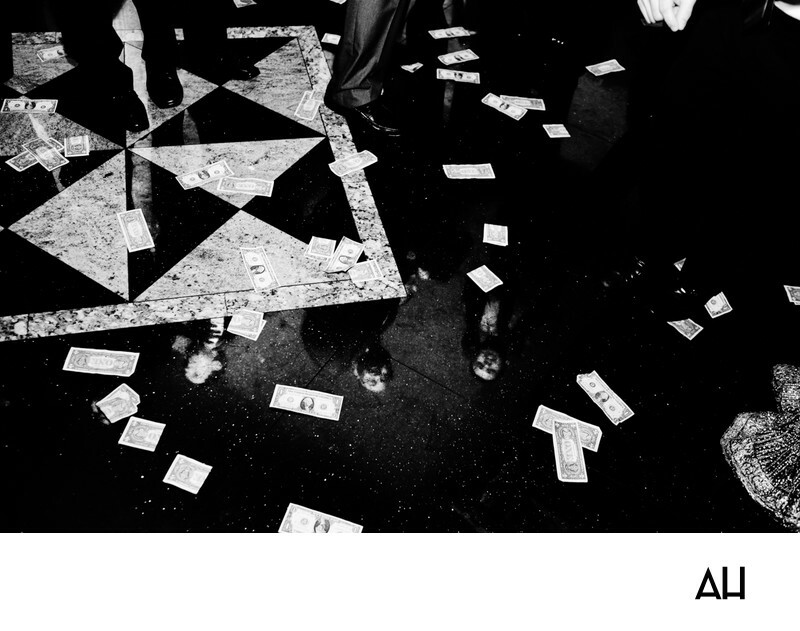 The shining black floor is decorated with bills and the reflections of wedding guests, who don’t seem to notice the money at their feet. They are too preoccupied by the wonder of the wedding events and the other guests swirling around them.